Located 7.5 kilometers southwest of Fengyang County, the Mausoleum is one of the four large mausoleums of the Ming Dynasty in China, along with the Ancestral Mausoleum in Sixian, the Xiaoling Mausoleum of the Ming Dynasty in Nanjing, and the Ming Tombs in Beijing. After 600 years of winds and rains, only a few parts are left, including stone sculptures. 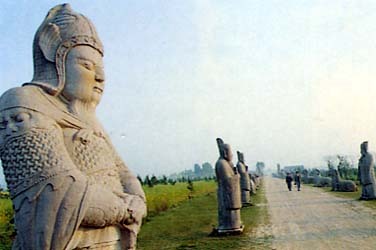 These vivid stone sculptures are the best example of the excellent skills of stone carving in the early Ming Dynasty. The Mausoleum is a major unit of relics under state protection.